The Flying Potter has lots of ideas and formats that can be tailored to suit your particular needs. We can provide drop-in sessions where participants make individual works to take away on the day or build a larger collaborative structures to be fired and returned. Office parties: What could be more entertaining than watching your colleagues wrestle with a lump of mud spinning at great speed! Making a pot on the potter’s wheel is one of those ‘I’ve always wanted to do’ activities. This fun session offers the opportunity to do just that! Accessible: Sessions designed for all ages and abilities, 8 months – 80 years! There are no mistakes with clay – just happy accidents and learning opportunities. Everybody can join in and achieve amazing results. A totally unique ‘corporate entertainment’ experience – Ideal for a client events evening or a motivational staff away day. Have a go! Making a pot on the potter’s wheel is one of those ‘I’ve always wanted to do’ activities. This fun session offers the opportunity to do just that! Everybody can do it: There are no mistakes in pottery – just happy accidents and learning experiences! The positive, inclusive nature of the instruction means everybody can join in the fun and achieve amazing results. 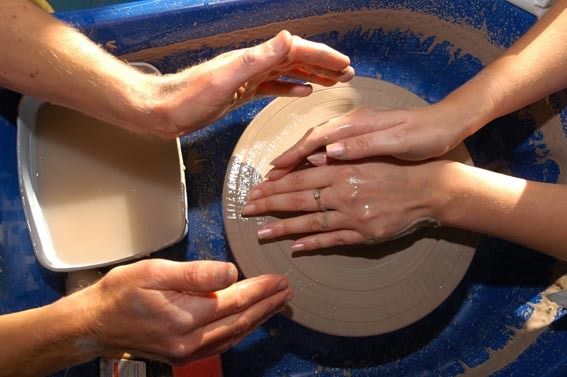 Part of a larger event: A potter’s wheel would make an exciting and unexpected addition to a larger event you may be planning. It could be a full-scale participatory session or a continuous demonstration for your clients as they relax in the bar!Home or away: The convenience of the Flying Potter conducting workshops at your venue has many benefits. However, you may be looking for an away-day event. Why not visit the home of the flying potter, Eastnor Pottery on the beautiful Eastnor Castle Estate? The studio can accommodate up to 12 adults and has a lawn area ideal for summer picnics.